Ladies and Gentlemen, we have to cover some serious business here now. There's an old Deadhead adage that goes something like this: The Grateful Dead went downhill from the beginning. They were never as good as yesterday. Where the hell is Pigpen, anyway? While no one is going to argue that there were huge peaks (and valleys) throughout the decades that span this band's career and that certain years were better than the year, or years prior, if you stack the decades against each other, it's hard not to give the nod to the 60's as the band's most formidable decade. The band's output from 1965 to 1969 might have the highest mind-blowing moment per note played ratio than any other decade. No, the 60's didn't weave the magic of 1972 through 1974. 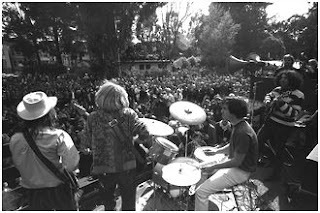 But none-the-less, 60's Grateful Dead typically ran circles around all other years in many many ways. You hear the stories from the old old Heads. There were people who stopped going to see the band play in 1967 because they had gone so far downhill (I'm not making this stuff up!). As unimaginable as this sounds, we're at a disadvantage now to call these deserters crazy. While I don't have exact numbers in front of me, there were some 150 show dates in 1966, and another some 130 in 1967, almost all played in the Bay area. We have but a few pockets full of these documented on audio tape. It's even hard to summarily dismiss 1966 and '67 as paling to 1968 and '69 when the amount of physical evidence is so lopsided. We (most of us) weren't there. Let me just say this: There was a band called the Grateful Dead in 1966 and 1967. They were not exactly the Grateful Dead of 1968-69, nor the Dead of 1972, '82, or '92. From all that I've heard of that band, I would have been terrified to take them on in a battle of the bands if I had to walk in with something like 1980's Dead. That earliest period explodes with transcendence that can catch you off guard. '66-'67 Dead has a swagger to it. It knows it's good. It knew it was leading a musical revolution. And it wouldn't just steal the face right off your head - it would brazenly remove your face in broad daylight, do what it wanted with it, and politely hand it back to you wishing you a wonderful life after changing you forever. The music we have from this era marks a band in rapid transition. The music from early 1966 tends to feel more safe and tidy than the music from the summer just after. The band gets more cocky (always in a good way; Jerry's charm and charisma saw to that), and more relaxed; the music going in more directions. In the tapes from December '66 you can tell the band has evolved even more so. By 1967, it becomes easier to sense that they may never have been better. Everything on tape is riviting. Hearing the band catapult in power from March to September makes one pine painfully for all the stuff that's missing on tape. As the year draws to a close, and Anthem Of The Sun sessions begin coming together, we clearly have a live band who has mastered the dials, buttons, switches, and wires of its complex machine. It's as if they've been using the machine since the start, but now, after less than two years, they are virtuosos. Early Dead can take some effort to get into. It really isn't the Dead of post '68. But it's well worth the effort, and you owe it to yourself to weigh in on your own personal argument about when the Dead were at their peak. Seek out the shows. Listen to the bonus material on the early album discs from The Golden Road Box Set. You won't be disappointed. All of the musical exploration that you hear in '72-'74 took root in those days. That telepathic interplay was already in full gear. It must have been the acid, LOL. In '66-'67 The Dead didn't NEED songs to entertain and thrill the audience - the ecstasy and drive of their heavily amped-up instruments was enough. Add to that Pigpen's total mastery of the Blues and you had quite a show. Still, I wouldn't necessarily say that the boys were the best 'Frisco band at the time... That honor would go to none other than the Jefferson Airplane - they had the jams AND the songs. more articles about primal dead. oh so many more, please.